EDWARDS AFB – Within the Wingman Day construct, resilience is just another word that relies on people to show its true significance. 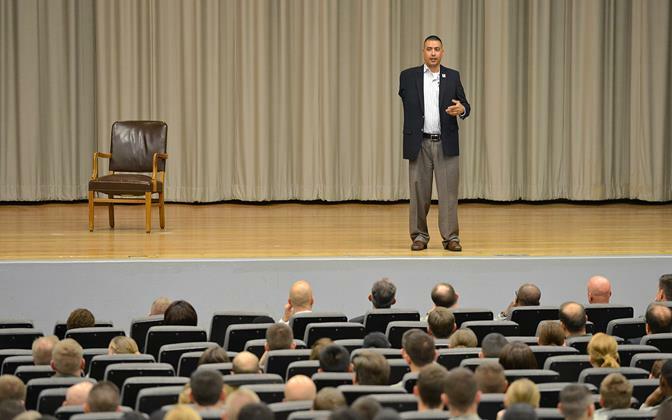 In the case of Norberto “Norbie” Lara, a wounded warrior who takes his inspiring story around the country as a spokesman for Warriors Speak, Lara spoke about resiliency and life challenges to a packed house at the Base Theater as part of Team Edwards’ Wingman Day activities this week. While addressing the crowd, Lara retold how he sustained his injuries, while on a combat patrol in Iraq. After the account, much of Lara’s story of resilience wasn’t about what he underwent in combat but more about what the recovery process was like, which was what he said is the true test of character. 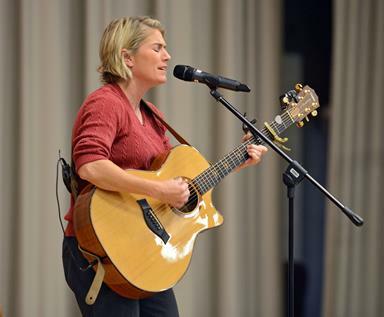 As part of the Wingman Day event, Jen Housholder from Hous Band also performed in support of the Wingman Day initiative. Housholder, a radar engineer with the 775th Test Squadron at Edwards and a U.S. Army Reservist, spoke about her personal journey from combat to recovery through the power and therapy of music. “Music is a powerful tool. It permeates through any walls that people may have up, even ones they are not aware of and really reach into the heart. It’s not the only way, but it certainly is a way to draw people in and help communicate a message,” Housholder said. In addition to the Wingman Day guests, the Healing Horses and Armed Forces organization was also in attendance to share the free equine assisted learning programs they provide for veterans, active duty servicemembers and their families. For more information about Jen Housholder’s story and music, visit www.hous-band.com.